It’s already well documented that hello Kitty loves her drugs whether it be Hello Kitty cocaine or Hello Kitty marijuana accessories. And with the way that those who follow the evil feline dress up for raves (NSFW), is it really any surprise that Hello Kitty ecstasy exists? where did youu get them????!!!!! I wanna try them!! nope, this is a lie. those are little candies that taste like sweet tarts. i got a bunch of them last year for xmas. i had some in a little tin and then some in boxes. apparently they came from Target. I was thinking the same thing, that they just look like the normal candies placed on top of a baggie. Yes they look like sweet tarts to me. I’d agree with Catbunny; the bow has definitely been replaced with a pill or capsule, so these are not an officially licenced product. It doesn’t really look like a capsule pill. Capsules will have one break point, not two. So their wouldn’t be two lines. That pill comment was just a failed joke. If anything, it looks like a bandaid. Whoever sent this photo in please email me…if these are real, I want some. Of course these are fake! These are the little tart candies they sell in those tins at Target, at least I HOPE THEY ARE…. Very good Emmie! HK has now gone to a new level. I hate to break it I think this is real. It is not uncommon ecstasy use cartoon characters. I actually had these before… they are actually candies. Somebody gave me. The bow is replaces with a bandage. If real, I’d roll on these. 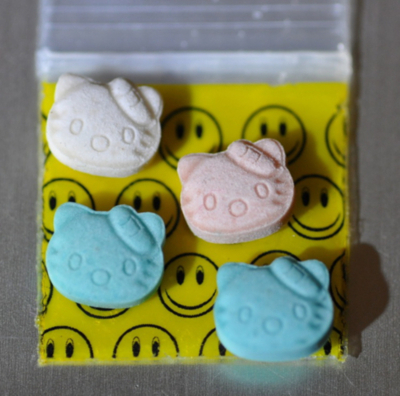 i’ve seen actual hello kitty ecstasy. someone i know used to sell them. Those look like candy and if they are not… They are bunk pillz. I can look at that picture and tell. I have seen many xtc illys in my life and I can tell you right now.. That is anything BUT MDMA. I know this is an old thread but I just wanted to offer some valuable infor in case any stumbles across old batches of real HK e-pills. My serious party days ended about 2 years ago but the 3 prior years to that, batches of these were going around the east coast from various pill pressers and all were highly adulterated. My test kits read everything from heroin, cocain, methamphetamine, caffeine, piperazine, etc. and minimal levels of actual MDMA. Granted, most ecstasy users know theirs pills aren’t “clean” these were some of the most dangerous pills going around.